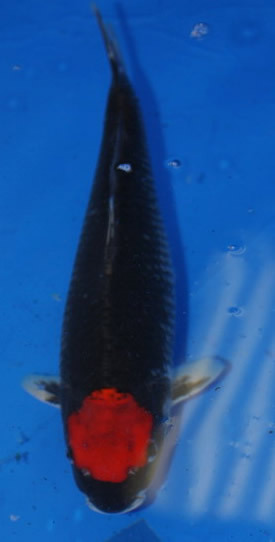 A tancho is any koi with red located only on the head. If it has red anywhere on the body other than the head, it is no longer considered a tancho. 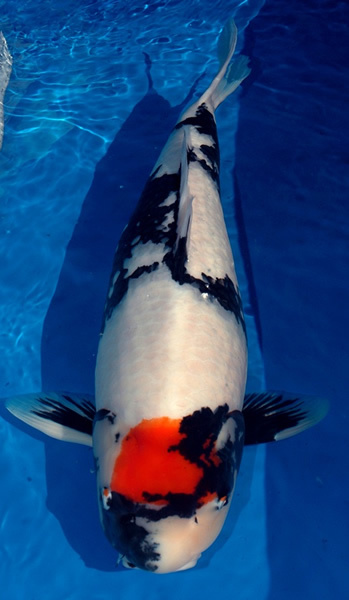 Named for the Tancho Crane, and very popular in Japan due to the similarity of this type of marking to the Japanese flag, tanchos have their own class in koi shows. This class generally includes tancho kohaku, tancho sanke, and tancho showa, but may include other types of tancho as well, such as tancho goshiki, tancho beni kumonryu, or tancho ochiba. The inclusion of these other types of tancho is determined by each club and show chairman. The tancho marking may have many shapes, however a round shape is considered ideal. The size of this mark should be as large as possible without going past the eyes, back onto the beginning of the scales, or too far forward on the forehead, and it should be centered. Other shapes sometimes seen are square, cross-shaped, or irregular flowery-type shapes. Any of these are acceptable on a tancho as long as they are uniformly shaped, are centered on the head, and have a pleasing look to the eye. 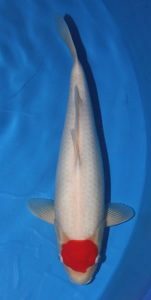 Purchasing a young tancho can be risky as they frequently will lose the tancho mark as they mature. It is best to buy them at two or three years of age, as the mark will generally be stable by this time. You want to look for a tancho marking that appears thick, with no windows or light areas, and with clean, sharp edges. In the case of tancho sanke or tancho showa, look for a pleasing, well-balanced sumi (black) placement to complement the red marking. My favorite is tancho showa, especially the ones with black partially covering the tancho mark – giving the appearance of clouds passing in front of a full harvest moon. MPKS is a not for profit, hobbyist organization whose members share a common interest in koi (Japanese colored carp), goldfish, water gardens and backyard ponds. Our members reside mostly in Chicago and surrounding counties as well as Michigan, Indiana, Iowa, Wisconsin, and Missouri.